To hugs, cheers and tears, rescuers using a missile-like escape capsule began pulling 33 men one by one to fresh air and freedom at last early today, 69 days after they were trapped in a collapsed mine a half-mile underground. Underground odyssey: What happened below & above the ground? The miners had nearly been given up for dead after a collapse in the copper mine on August 5 till the breakthrough on the 17th day. The news electrified the rescuers, and sent whoops of excitement around the world: the 32 Chileans and one Bolivian were still alive. Thirteen men were pulled out in the first hours of the apparently problem-free operation in the San Jose gold and copper mine in Chile’s northern Atacama desert -- a drama that saw the world captivated by the miners’ endurance and unity as officials meticulously prepared their rescue. First out was Florencio Avalos, who wore sunglasses to protect him from the glare of bright lights. He smiled broadly as he emerged and hugged his sobbing 7-year-old son, Bairon, and wife, then got a bear hug from Chilean President Sebastian Pinera shortly after midnight local time. Like wives on the surface who had their hair and nails done for the occasion, the men looked groomed and clean-shaven. A second miner, Mario Sepulveda Espina, was pulled to the surface about an hour later - his shouts heard even before the capsule surfaced. After hugging his wife, Elvira, he jubilantly handed souvenir rocks from his “underground prison” nearly 2,300 feet below to laughing rescuers. Then he jumped up and down as if to prove his strength before the medical team took him to a triage unit. The operation was executed almost flawlessly through the night and included dramatic live images of miners hugging rescuers in their tunnel deep inside the mine. 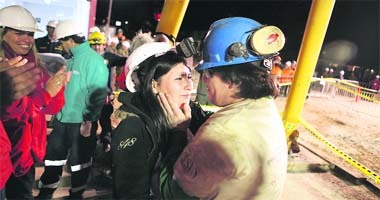 An estimated 1,500 journalists from around the world were at the mine to report on the rescue. 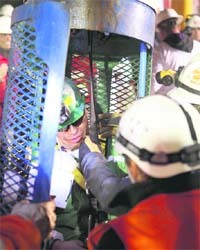 A third Chilean miner, Juan Illanes, was rescued after another hour. The lone Bolivian, Carlos Mamani, was pulled out fourth, the youngest miner, 19-year-old Jimmy Sanchez, was fifth, Osman Isidro Araya came out sixth and Jose Ojeda, who turned 47 on Monday, was seventh. Mamani was greeted by his wife, Veronica, with a hug and kiss that knocked off her white hardhat as Chile’s President and First Lady held small Bolivian flags. Mamani also gestured with both forefingers at his T-shirt, which said “Thank You Lord” above a Chilean flag. He shouted “Gracias, Chile!” before a round of backslapping with rescuers. From the August 5 cave-in until they established contact with the surface 17 days later, the miners rationed themselves to two spoonfuls of tuna, half a cookie and a half-full glass of milk every 48 hours. Once rescuers on the surface discovered the men with a narrow perforation drill, they began sending them hydration gel, soup and medication in narrow plastic tubes called “doves.” Doctors transitioned them to a solid diet to keep them slim enough to fit in evacuation shaft. The first sign of life from the miners came on August 22, when knocking was heard on a drill head as it reached the depths of the mine. Rescuers withdrew the drill to find a note attached reading, “The 33 of us in the shelter are well.” Once the first bore hole established a lifeline to the men, letters began to pass between loved ones via the “doves.” Later came a fiber optic line enabling phone calls and videoconferencing. Doctors were also able to pass down a biometric belt. Once they were discovered, the men quickly established a regular meal schedule including breakfast, lunch, dinner and afternoon tea. Supported by a 500-watt powerline, they installed lights to simulate day and night to diminish the impact of their eventual return to the surface. In recent weeks, the miners began to help with the drilling process, taking shifts to clear away debris that fell into the tunnel of the mine. The miners had nearly been given up for dead after a collapse in the copper mine on August 5 till the breakthrough on the 17th day. The news electrified the rescuers, and sent whoops of excitement around the world: the 32 Chileans and one Bolivian were still alive. From that moment on August 22, the amazing story unfolded, piece by piece. The miners were alive because they were well organised, thanks to leadership from shift boss Luis Urzua, 54, and other mining veterans, like former merchant sailor Mario Gomez, 62. For 17 days, through the “hell” of constant darkness, high humidity, in 35 degree Celsius, they devised tools and routines that kept them alive, sane and relatively healthy. Food was the first request. They had dwindled to shadows of their former selves. “Under this sea of rock, we are expecting all of Chile to pull hard so that we can be taken out of this hell,” Urzua told Chilean President Sebastian Pinera. Soon, there was a routine. Every essential and even non-essential item that would fit in the 10-cm wide shaft, except alcohol, was delivered. Communications, power and water lines were installed, live football games transmitted. Astronauts and psychologists counselled miners on coping with isolation and trained them to deal with the onslaught of publicity and maybe money for their stories when they emerge. Letters to family came back, along with dirty laundry. “When I get out, we’ll buy the wedding dress and we’ll get married in a religious ceremony,” Esteban Rojas promised his partner Jessica Yanez. After 25 years, they have children and grandchildren but no marriage license.